tim goeglein is a fort wayne native who works in the white house as a special assistant to the president. he also writes occasional columns for the fort wayne news-sentinel on the side. or, perhaps i should say, he plagiarizes them. but at least he admitted it when he got caught. 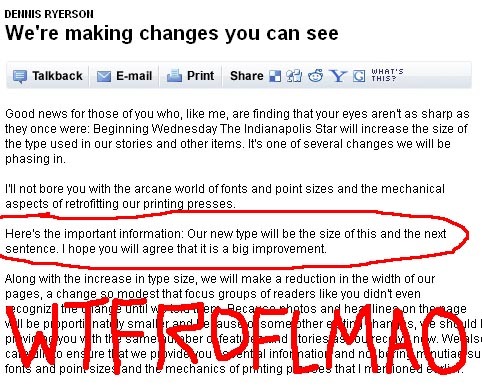 dennis ryerson at the indy star has finally learned what term-paper-writing teens have known for years: you can make your paper seem longer if you crank up the font size and the margins really huge! [...] I was intrigued and a bit amused the other day when Mayor Greg Ballard mentioned something about a Chinatown to a local business leader, after a news conference on the city's 2012 Super Bowl bid. A colleague and I quickly asked the new mayor about the Chinatown talk. Ballard smiled and told us -- perhaps to the horror of his press secretary -- about his desire to create a Chinatown somewhere on the Near Southside. "You go around the world -- San Francisco or London -- and Chinatowns are some of the best places," he said. "It's just fun and cultural, and it would make the Chinese community feel welcome in the city." for one thing, as tully notes, you don't just build a chinatown—though that might be a cool feature for the next sim city game. chinese immigrants build chinatowns by immigrating to a city and taking over a neighborhood en masse. this isn't field of dreams; you can't just build a chinatown and expect a bunch of chinese people to suddenly show up and turn it into a thriving cultural hotspot. i live on the northwest side. these days there are a lot of mexican restaurants in my neighborhood. the closest one, which closes down and comes back with a new name every three months, didn't even have english on the menu in its last incarnation. and if you go a few miles south of here, you'll find yourself in a burgeoning little mexico. virago & i think that's great, because we love real mexican food, and if they don't serve menudo (and maybe pozole) on weekends then it's not real mexican food. that's how you build an ethnic community: with a steady stream of new immigrants over the course of a decade or two. but a lot of hoosiers don't feel the way i do. in fact, just yesterday, house republicans stormed out, enraged that they wouldn't be allowed to "strengthen" the immigration to sufficiently punish undocumented immigrants (much to the horror of the bill's sponsor, who had been insisting his bill wasn't racist). maybe i'm just cynical, but i can't see them being much happier about a similar wave of chinese immigrants, which would be a requirement for creating a viable chinatown. 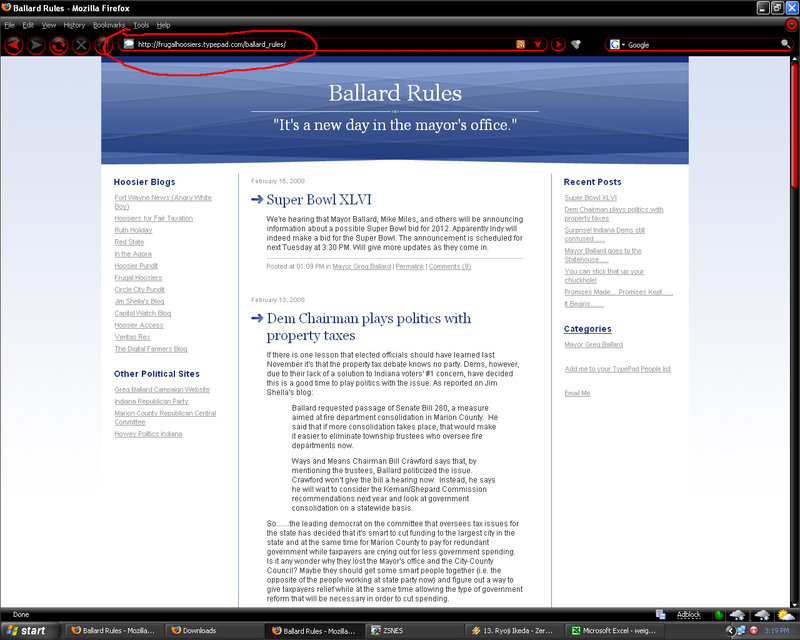 last week, someone started an angry pro-administration blog called ballard rules. this week, it's already gone, prompting speculation at about why it died so quickly and who was behind it in the first place. one commenter suggested that it might be written by the people behind another angry right-wing blog, frugal hoosiers, noting that the "email me" link on the blog had pointed to a frugal hoosiers email address. so i decided to follow up by checking the google cache—always handy when a blog gets deleted. lo and behold, i discovered that not only was this true, but the blog had been running on frugal hoosiers's typepad installation, where it is still visible, right down to the attacks on a two-month old baby. i figured i should take a screenshot for posterity, in case they take down that version, too. While introducing Gov. Mitch Daniels at a Whitley County Lincoln Day dinner, he told a disparaging joke about Democratic House Speaker Pat Bauer. Bauer is used to being made fun of – his height, his hair – but Bell told a fictional story about him and some GOP colleagues who were driving along Interstate 69 when they came across an overturned bus on the side of the road labeled "House Democrats." The joke continued with a local farmer telling the Republicans that it was a terrible tragedy with many fatalities. "Were there no survivors?" asked the reps, to which the farmer replied that Bauer said he was alive "but you know how he lies" so he was buried anyway. apparently the joke didn't go over very well, probably because it's poorly constructed. the meat of the joke comes from all those dead liberals; trying to twist it around to be about speaker bauer being a liar destroys the dramatic tension. besides, bell's audience probably thinks all democrats are liars, so singling out the speaker makes no sense. "how can you tell? they're all brain-dead anyway!" 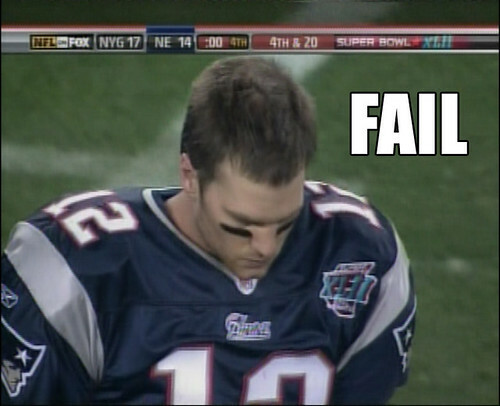 "nope. i guess that proves seatbelt laws don't work!" "i didn't check. i don't believe in busing." "i didn't check. i don't believe in public transit." "yeah, but we took 'em behind the barn and shot 'em, 'cuz i recoken their lives weren't worth living like that." "you mean, because they're horribly disfigured?" "no, i mean because they're democrats." Q: what do you call a busload of dead democrats? the full video of mayor ballard's house testimony is up, and reports are that it's even more embarrassing than i thought. also, today news got out that two weeks ago, ballard's press secretary sent out a memo demanding that nobody in the administration correspond with WTLC. this is not only shockingly childish and unprofessional, but quite possibly illegal. and republican congressional candidate and state rep jon elrod was caught on tape "writing campaign letters while on the floor of the House and handing them to a legislative employee to mail". while it appears that elrod technically broke no laws himself, the employee who mailed the letters did break house rules, and the whole situation was awkward enough that minority leader bosma had to sit the two down and give them a "stern talk". the writers strike is over! word of a tentative deal has been circulating for about a week, but the new contract wasn't official until WGA members voted for it, which they did yesterday. the writers achieved some major gains—getting residuals for content on the internet and doubling the residuals they receive from DVDs—but didn't get everything they wanted. the cost of the strike was often steep, for both sides, but overall this was a successful strike for hollywood writers. He told lawmakers that there's "fluff" in the Marion County budget. But he had few answers for them on where he would cut. "Everything is on the table," he said, but repeatedly fended off questions by saying he had only been in office five weeks. State Rep. Win Moses, D-Fort Wayne and a former mayor, said that answer wasn't good enough, and pressed for more details. Asked if police would be laid off, Ballard said no. Asked if firefighters would be cut, Ballard said "I can't say. I just don't know. You're asking me questions that I don't know." Moses fired back: "I'm asking questions that you must know." And, he added, "I know you don't mean everything you're saying." Ballard couldn't say everything was on the table, he said, and then say that police wouldn't be cut and that the possibility of raising local income taxes to pay for the property tax relief was not a viable option in Marion County. so there's fluff in the budget, but he can't identify it (other than that he wants to start buying priuses). everything's on the table... except for the stuff that isn't. and that whole "it's my first day" excuse only goes so far—not to mention that you can't apply it selectively. the "newbie dodge", as you could call it, is similar to the "incompetence dodge" in that it effectively invalidates everything you do or say. if you haven't been around long enough to know any answers, then there's no reason to listen to you. you can't claim to be a voice of authority and simultaneously say you don't know what's going on because you just got here. it does not compute. stop wasting everyone's time and come back when you know something. then again, what else could he have said? other mayors and county officials from the rest of the state know that the proposed caps will seriously dig into their budgets and force them to either raise taxes or make major cuts in services. but mayor ballard campaigned on a platform of "how dare mayor peterson raise our taxes" and "i'll cut the budget a whole bunch without major service cuts", so there wasn't much he could do other than ask for a handout. the indy star has an article today about friend-of-the-site bil browning, who, with the help of others, has revamped the old bilerico blog into a national blog that's grown so successful that he can now live off its income. to be honest, i sometimes miss the old bilerico. as a hoosier, i felt i could relate to it more than i can the current version, and there are only a handful of hoosier-oriented blogs worth reading, as opposed to a bazillion national political blogs out there. (plus, let's be frank, they used to link me on the blogroll but no longer do; that's their prerogative.) but supporting yourself through your blog is many a blogger's dream, and extremely difficult to achieve—and i do like some of the new features and contributors (though not all). so clearly bil's been doing something right. the indy star's matt tully has a good column today about how indiana's democratic delegates will be divvied up, if indiana's primary turns out to mean something for a change, which is looking increasingly likely. then he finishes the column with a corny pun that made me crumple up my face as if struck by a pungent odor. oh well; most of it is good. Jon Elrod was asked about hiring 1 to 1 Media, the marketing company connected with Eric Miller's Advance America. Elrod said his campaign hired the company and he didn't know who was hired. He also said his website is built and he has no plans to change it. He mentioned he felt no need to speak out publicly on this because his record supporting the hate crimes bill and his stance against SJR7 speaks for itself. not a particularly encouraging response. he didn't know who was designing and hosting his site, and apparently doesn't care. he might disagree with eric miller and his cronies on these two issues, but he doesn't mind giving them money—which he presumably continues to do, as his domain remains registered to main-1-media, which suggests that they are now hosting the site in addition to having designed it. as every other blog aside from this one has already mentioned, yesterday was super tuesday, when about half the US holds its primary elections. 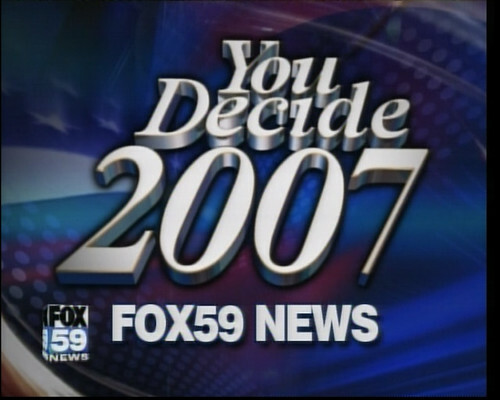 on the democratic side, the big news is... still no clear frontrunner. clinton and obama are still quite close in the race for delegates. it could go all the way to the convention, which would be exciting if a bit crazy. but more specifically, this means that indiana's near-last-in-the-country presidential primary might actually mean something! hoosier voters might get an actual chance to go into the booth on may 6th and cast a real, meaningful vote for the democratic nominee. that hasn't happened in my memory, if in my lifetime. this might force me to choose between clinton and obama. i'd be happy to vote for either of them, as either would be a billion times better than the republican frontrunner, john mccain, and a bazillion times better than our current president—not to mention that either will put an end to the 200 years of white dudes holding the office. if i had to pick today, i'd probably pick obama: he's more the "inspirational" candidate while hillary is a more "practical" candidate, and i gotta go with inspiration over pragmatism. but i don't have to pick today. as for mccain wrapping up the republican nomination, it's a bit of a surprise. over the past eight years he's sold out everything people used to like him for, and the conventional wisdom a few months ago was that his campaign was dead. but the field of republican candidates is such a pack of jokers that i guess mccain doesn't look like as a big a loser as the rest. even the right-wing pundits hate him now, with even ann coulter saying she'd rather support hillary. i wonder whether anyone will show up on february 10 to protest at the local scientology mission in south indianapolis (6451 rockville rd)? then i have good news and bad news. the good news is that i have an all-new, all-different design that you might prefer! the bad news is that you might like the new design even less. 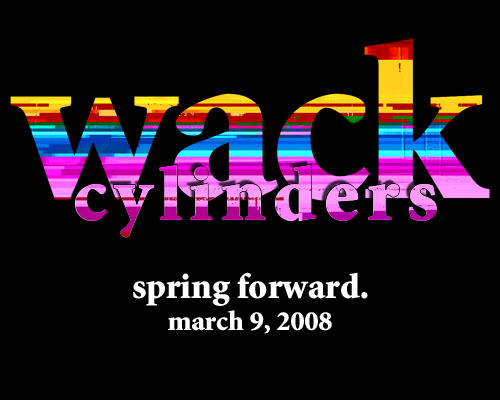 i'd been thinking of redesigning the blog for awhile, and decided to finally do so to coincide with the impending release of wack cylinders, my first solo album since 2004. believe it or not, wack cylinders will be my first release to feature databent album artwork, so to commemorate the event, the blog now features not one but five databent backgrounds! leave your comments, and especially your bug reports.